Different countries and regions have different conventions for formatting numerical and time-based information. Locale settings provide information about the formats used by the current user and must be considered when writing code that handles user-facing data types. The user sets the locale by choosing a region in Settings on iOS devices and System Preferences on a Mac. The user can also change locale settings while the app is running. Therefore, if you manipulate data objects in your code and then present them to the user, use the locale APIs to format the data correctly. You do not need to know how to format data in all the different locales. You can use preset styles that automatically generate locale-sensitive formats. You can use custom formats as long as you convert them to locale-sensitive formats before presenting them to users. This chapter explains how to write locale-sensitive code. Locales represent the formatting choices for a particular user, not the user’s preferred language. These are often the same but can be different. For example, a native English speaker who lives in Germany might select English as the language and Germany as the region. Text appears in English but dates, times, and numbers follow German formatting rules. The day precedes the month and a 24-hour clock represents times, as shown in Table 4-1. Mac users can also customize the formats of dates, times, and numbers by clicking the Advanced button, as described in Reviewing Language and Region Preferences on Your Mac. An NSLocale object encapsulates information about the formatting standards of a particular region. When you format user-facing text, you pass an NSLocale object representing the user’s selected region. The NSLocale class provides class methods for obtaining the user’s locale object and other information about supported locales. You can obtain the user’s locale using either the currentLocale or autoupdatingCurrentLocale class methods in the NSLocale class. If you use the currentLocale method, the property values of the returned object are guaranteed not to change. Therefore, use the currentLocale method if you want to perform operations that need to be consistent. If you use the autoupdatingCurrentLocale method, the property values can change when the user changes the region settings. However, you are not notified if the returned object changes. 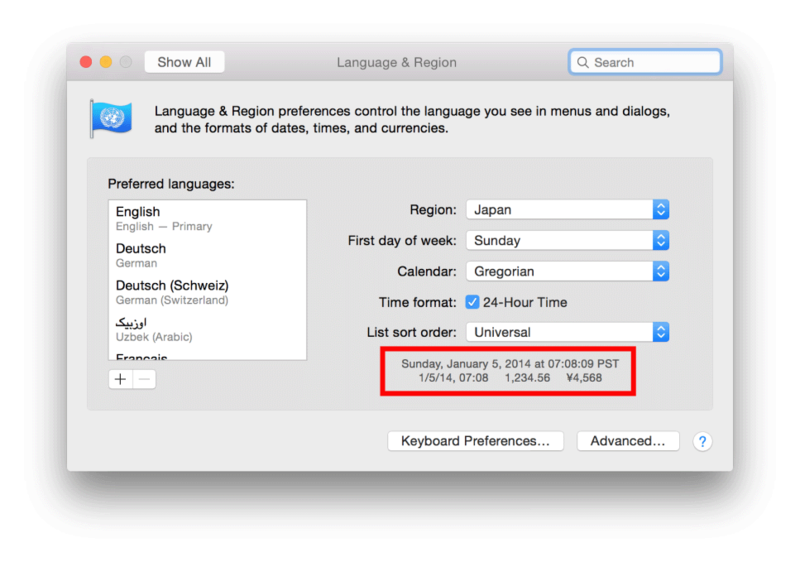 To observe locale preference changes, read Registering for Locale and Time Zone Changes. Tip: The system settings are not the same as the user’s settings. Don’t use the systemLocale class method to get the user’s locale. For a complete list of locale property keys, see NSLocale Component Keys. The identifiers that specify languages and dialects in APIs and folder names—for example, de-CH, en-AU, and pt-PT—shouldn’t be displayed to users. To get a human-readable, localized language or dialect name, use the displayNameForKey:value: method in the NSLocale class, passing NSLocaleIdentifier as the key parameter. Get the language that the app is using. The returned string is a language ID that identifies a written language or dialect, as described in Language and Locale IDs. Get the associated locale object. If you pass the language ID as the locale ID parameter, a locale for the language is returned. For example, if you pass de-CH as the language, the Switzerland locale is returned. Get the localized language name. Beginning and ending quotes, which vary in different languages, can be obtained from the locale object. Use the same technique, described in Getting Localized Language and Dialect Names, to obtain the default locale for the language, and then use the locale component keys to obtain the language-specific quotes. Get the beginning and ending symbols for quotes from the locale object. Format a string using the locale-sensitive quotes. Table 4-2 shows the results when myText is “@iPhone”for different regions. If available, use the alternative, locale-sensitive NSString method for user-facing text. There are locale-sensitive methods for creating strings with formats, changing the case, obtaining ranges within a string, and comparing strings. This method uses the system locale. To specify the user’s locale preference, pass [NSLocale currentLocale] as the locale parameter to either the initWithFormat:locale: or initWithFormat:locale:arguments: method. For best results, use data-specific formatter objects and preset styles, described in Formatting Dates and Times and Formatting Numbers. If you pass nil as the locale parameter, the system locale is used, which is incorrect. To specify the user’s locale preference, pass [NSLocale currentLocale] as the locale parameter. You use the NSDateFormatter class to create localized string representations of NSDate objects that are also locale-sensitive. NSDateFormatter objects are often attached directly to text fields in an Interface Builder file, but if you create NSDateFormatter objects programmatically, be sure to use methods that return localized string representations. Note: The NSDateFormatter class is not thread-safe. See Threading Programming Guide for details. For example, specify a medium style to abbreviate text—such as “Jun 10, 2013”—by passing NSDateFormatterMediumStyle as the style parameter. Specify a short style for numerical only representations—such as “6/10/13” or “11:03 AM”—by passing NSDateFormatterShortStyle as the style parameter. Table 4-3 shows the results of using preset formats when English is the language and United States is the region. Table 4-4 shows the results of passing NSDateFormatterMediumStyle for the date style and NSDateFormatterShortStyle for the time style for different languages and regions. Use custom date and time styles only when the preset styles don’t meet your needs. However, convert your custom format to a locale-sensitive format before getting string representations of the date and time. The dateFormatFromTemplate:options:locale: class method in the NSDateFormatter class rearranges the given template to adhere to the specified locale. Use the dateFormatFromTemplate:options:locale: class method to get a localized format string from a template that you provide. The template parameter of the dateFormatFromTemplate:options:locale: method should adhere to Unicode Technical Standard #35, described in Use Format Strings to Specify Custom Formats. For example, the template @”dMMM” specifies that the day of the month and abbreviation for the month should be in the format string. The order of the symbols and any non-symbol characters in the template are ignored. Set the format of the NSDateFormatter instance to the locale-sensitive format string. Use the stringFromDate: method to get a localized string representation of the date. For example, if you don’t convert the @“MMM d” string to a locale-sensitive format, the results are not localized, as shown in the second column in Table 4-5. The user enters dates using localized formats, so parse input strings accordingly. Use an NSDateFormatter object to convert a localized string to a date object. Set the date formatter’s style using one of the preset styles. (Use a template format string only if a preset style doesn’t work.) Also, allow the date formatter to use heuristics when parsing the string. Create a date formatter object. Set the formatter’s style to a preset style. Replace NSDateFormatterMediumStyle with the style you expect the user to enter. If the input string is not expected to contain a time, set the time style to none. Set the leniency to YES (enables the heuristics). Convert the string to a date object. For example, if the locale is United States, the input string is 9/3/14, and the preset style is NSDateFormatterShortStyle, the date is interpreted as 2014-09-03 07:00:00 +0000. However, if the locale is Germany, the date becomes 2014-03-09 08:00:00 +0000. Locale settings affect the format of numbers—such as the decimal, thousands separator, currency, and percentage symbols. For example, the number 1,234.56 is formatted as 1.234,56 in Italy. So use the NSNumberFormatter class to create localized string representations of NSNumber objects. Note: The NSNumberFormatter class is not thread-safe. See Threading Programming Guide for details. Table 4-6 lists the preset styles available and compares United States preset formats to other regions. The user may enter numbers using localized formats, so parse these input strings accordingly. Use an NSNumberFormatter object to convert a string to a number object. Set the number formatter’s style using one of the preset styles. Also, allow the number formatter to use heuristics when parsing the string. Replace NSNumberFormatterDecimalStyle with the style you expect the user to enter. Convert the string to a number object. The NSCalendar class encapsulates all the regional differences and complexities of calendars, shown in Table 4-7. The era changes more frequently in some calendars than others—for example, the era in the Japanese calendar changes with each new emperor. The number of months per year can be 12 or 13. The length of a month can vary from year to year. Even in the Gregorian calendar, the first day of the week can be Saturday, Sunday, or Monday. NSCalendar objects know about time zones and which regions observe daylight savings time. Calendar calculations—such as the third Tuesday of the month—depend on the user’s calendar and region. Therefore, use the NSCalendar class for all calendrical calculations such as computing the number of days in a month, computing delta values, and getting components of a date. You can use an NSDate object for internal calculations but use an NSCalendar object for computations of user-facing dates. Use an NSDateComponents object to access the calendar units of a date. Access the values for day, month, year, and era. Tip: Any time you fetch or set the year, also fetch or set the era. Era is not required for the Gregorian calendar, but it is for several other calendars. For more information on using the NSCalendar and NSDateComponents classes, read Date and Time Programming Guide or watch WWDC 2013: Solutions to Common Date and Time Challenges. To receive notification of time zone changes, observe the NSSystemTimeZoneDidChangeNotification notification. For example, if the user is traveling, the time zone might change while your app is running. A long time may elapse since the last time your app was active. Implement the change notification method to reformat and display all user-facing dates, times, and numbers using the user’s new locale settings.